Chair Care Patio: But What Do I Really NEED? Chair Care Patio help your create the perfect outdoor living space with beautiful new patio furniture replacement cushions for any kind of outdoor patio furniture. We offer all the best fabrics from Sunbrella, Outdura and more. Each and every patio cushion is custom made in our awesome sewing shop in Dallas, Texas. Our website also offers DIY patio furniture parts and supplies such as replacement patio slings, vinyl strapping, patio chair glides and more. But What Do I Really NEED? So...you've been staring at your back porch or patio for the last few months, deciding what to do with it, and you've finally decided to re-do it altogether! Coming up with things you like is easy. But coming up with things you really need is a little different. Might we suggest a few tips? 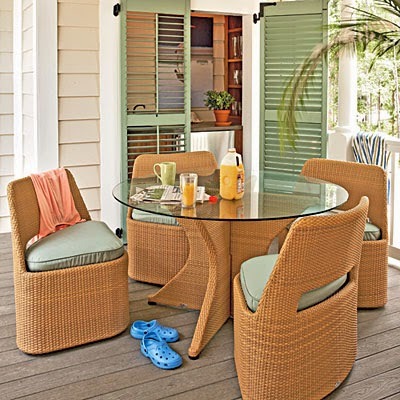 Patio furniture can help you increase the functionality of your yard or porch, whatever you've got! To make the best choices, think about what kind of furniture might be suitable for the kinds of activities you and your family normally indulge in. COMFORT! Plan ahead--you know already your grill will continue to get a workout, and you'll have company regularly, whether it's the neighborhood kids or grown-ups relaxation and entertainment time. And, that little corner over there is where you sit and have your coffee and read the paper every morning. So the first thing you want to consider is comfort for your established habits and routines! A few "low" deep-seating pieces which allow your guests easier access to chatting over drinks is perfect for that cozy, intimate feel. Sporty, sturdy and stackable vinyl or PVC is a good way to go for active kids, particularly when there's a pool nearby. MULTIPLE SEASONS? 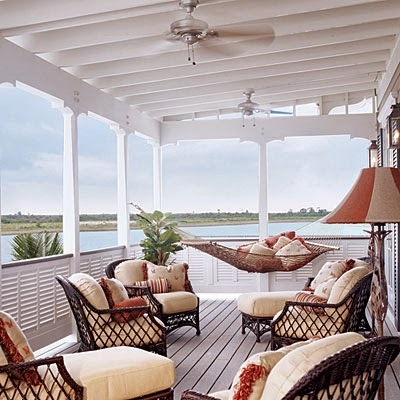 If you're lucky enough to be using your patio all year long, you definitely want to incorporate pieces with weather resistant frames and cushions. Most good-quality outdoor fabric is made to withstand sun, rain, mold, mildew, and suntan lotion (ideally, you would want to look out for this anyway, but if you live in far northern climes, it might not be as big a deal if your furniture is out for only a few months every year). 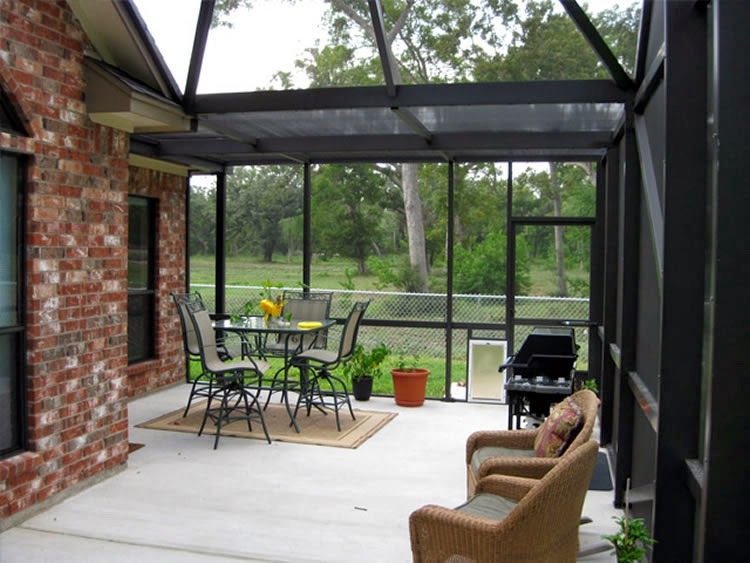 Consider newer wickers or coated aluminum frames-both are very resistant with minimal care needed. You can also purchase multiple sets of cushions to accommodate changes of seasons or holidays, if you're able to splurge. There are so many types and colors and designs of outdoor fabric for cushions and slings to choose from! The sky is the limit here. THE TABLE CAN MAKE OR BREAK YOU Do you dine a lot outdoors? Do the kids like to get crafty in between dunks in the pool? Tempered glass is great to top any table--it's shatter-proof and easy to clean. For the grown-ups only, or for that artful look, tiled tabletops are useful, too. A too-small table will drive you nuts. 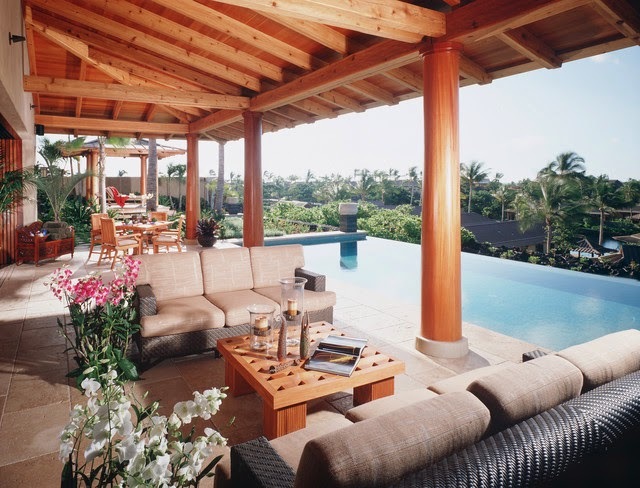 It's hard to be "too big", but if you've got the space, get a large enough table to accommodate a patio umbrella. It's practical AND decorative, and it will help protect you from the elements. DON'T CRAM IN TOO MUCH! If you've got a small space, don't overdo it. Beware of clutter! Go for the stackable chairs. And Bistro tables are practical and decorative too. The most important thing at the end of the day, though? Enjoy what you have. That's what outdoor relaxation on your patio is all about! Next week, we'll take a look at some of the cushion types Chair Care Patio can customize for you, along with some of our favorite past work (and maybe a kudo or two from one of our happy customers, who send us their work, because it's so satisfying to repair and beautify your living space yourself!). We LOVE what we do and we're glad it's for YOU! Fabulous and 50 something business owner that enjoys being creative. I have an awesome sewing shop in Dallas that makes outdoor cushions and pillows and other sewn products. We also repair better quality outdoor patio furniture for our North Texas customers. I also love camping and glamping with the Sisters On The Fly group of women. Custom Cushions--We Live and Breathe Them!